I won a contest on Kim's blog. There was only supposed to be one winner, but her baby kept pulling out names, including mine, so I got a prize, too. When we met up at the Starbuck's on the way to Austin, she gave me my prize. Look! 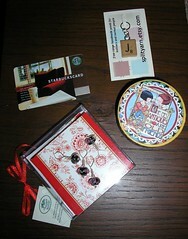 There's a Starbuck's card, some pretty little notecards, and some very pretty stitch markers (made by Kim) sitting on top of the notecards. And they were delivered in the cute box on the right. Thank you, Kim, and thank you, Kim's baby! And finally -- see that J scrabble tile stitch marker Caro gave me before Stephanie spoke. I love it -- thanks again, Caro! I haven't taken pictures of the new yarn yet. We actually shopped twice -- once before lunch and once after. Here's what I remember buying -- and, of course, I was in post-Harlot euphoria, so it's possible I bought more than I remember. And did I mention that HCW was handing out free Coronas and Shiner Bocks to cool us off? Carrying a beer made it a little more difficult to fondle the yarn, but a little easier to spend more money! So here's what I remember buying: Cascade 220 in two shades of red, two shades of green, and brown for the Flying Geese blanket (it's going to be a gift); two skeins of JaggerSpun Zephyr lace-weight in Ice Blue; a skein of Kidsilk Haze in Blushes and a skein of a Rowan Wool Cotton in a similar color (Rich, I believe), both destined for a pair of Mrs. Beetons; and two skeins of Lorna's Laces Shepherd's Sock in Black Purl, just because.